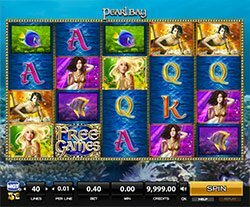 Dive deep into an exotic undersea world of beautiful mermaids and unmatchable treasures in Pearl Bay slot machine from High 5 Games! The game takes you on a 5-reel deep sea voyage with 4-rows and 40-paylines of breathtaking imagery. Swim among colorful fish, three different beautiful mermaids and sparkling treasures in the gorgeous Pearl Bay. As you might probably guess, the reels are set in the coral under the sea’s surface and spin with elegance as you try to make combinations. Accompanying the mermaid’s on screen are a male diver, a variety of fish and card symbols Q, K and Ace. You’ll also find the Pearl Bay game logo acting as the Wild symbol and a Free Games symbols which of course can award you Free Games. Pearl Bay features and incredible bonus round, complete with Locking Wilds and the Bonus Mega Multiplier, giving you a payback percentage of 94.9%. Free Games – Land three free games symbols in any position on reels 2, 3 and 4 to win 6 free games. Wilds – During normal play the Pearl Bay symbol is wild and substitutes for all other symbols on the reels except the Free Games. It can appear on reels 2, 3 and 4 only. Locking Wilds – The Pearl Bay symbol is the game’s wild symbol and substitutes for all other symbols except the multiplier symbol to complete winning combinations during free spins. It can appear on reels 2, 3 and 4 only. Increasing Multipliers – In the free games bonus round, you start out with a 10x multiplier for all your wins. During Free Games, for every ‘+1 Multiplier’ symbol awarded in the bonus round, the multiplier increases accordingly. Combine that with the fact that any wilds lock into place for the duration of the bonus round, and you’ve got an incredibly rewarding bonus round.